This time on the podcast, a conversation with John O'Neal, who has spent a lifetime in social justice theater. He was, in 1963, a co-founder of the Free Southern Theater, which was conceived as a cultural arm of the Civil Rights Movement; he is also founder and artistic director of that organization's successor, Junebug Productions, now celebrating its 30th year. Junebug is based in New Orleans, and gets its name from Junebug Jabbo Jones, a character created by members of the Student Nonviolent Coordinating Committee (SNCC) to represent the wisdom of the people. Junebug is looking for a new artistic director, as John is looking to return more seriously to writing -- the reason he got involved in the theater in the first place. Listen to the podcast on the player above (or click here to listen on iTunes) to learn more about what he's got in the works, and his reflections on theater as he prepares to retire from Junebug. Tomorrow (Monday, December 6, 2010) John O'Neal will be part of a panel discussion sponsored by the Open Society Institute, called "Unleashing the Power of Art, Culture and Media to Transform Black Communities." Click here for the live webcast of that event, 5:30-8:00pm Eastern Time. 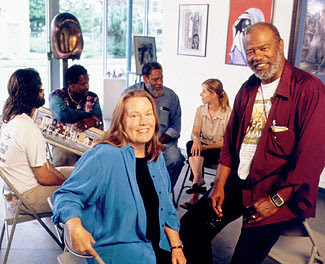 Photo by Carlton Mickle of John O'Neal (right) and Teresa Holden (center), longtime collaborators on Junebug's "Color Line Project," which collects stories about the Civil Rights Movement and its continuing influence on the struggle with racism. This work won the duo a 2002 Ford Foundation Leadership for a Changing World Award.